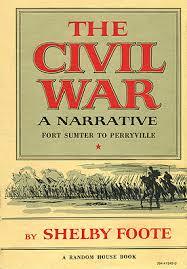 “The Civil War, a Narrative” by Shelby Foote is a feast for history buffs. Often requested from other libraries, we have at last our own copy. Foote had a novelist’s feeling for character and setting, and sense of drama. Yet does so without ever losing the historian’s regard for recorded fact. Disdaining the typewriter, he wrote all three volumes by hand. Looking for the short version? Alan Guelzo’s “Fateful Lighting” is lucid and compact rendering that clarifies both the ‘how’ (strategy, battles, politics) and the why (slavery).